Sticking an arm down the throat of a bear is regarded by some as an effective last-ditch tactic for fending off an attack. 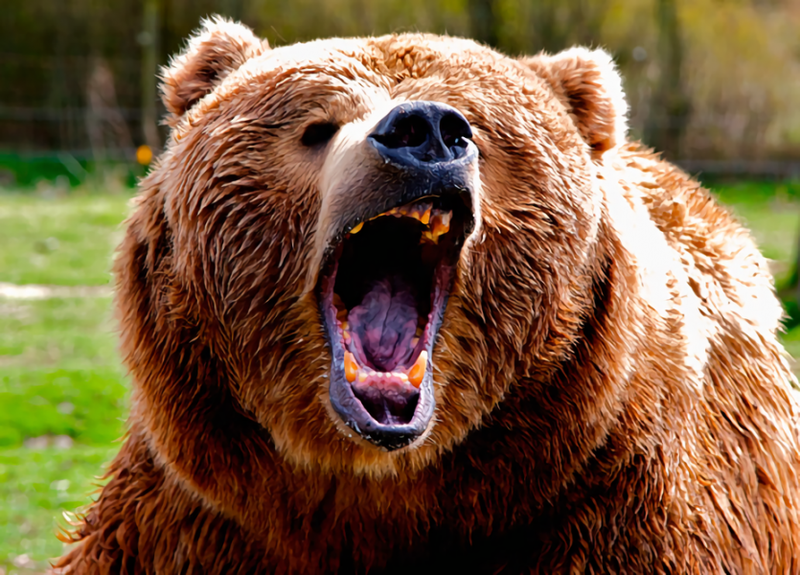 There are few animals in North America as frightening as an adult grizzly, and if one of these massive animals get it in their heads to attack you, your day just suddenly got a whole lot worse. Twenty-six-year-old Chase Dellwo was expecting to bag some elk in the Montana back country near Choteau last Saturday, but a chance encounter with a bear ended with him sticking his arm into its roaring mouth instead. That decision may have saved his life. According to the Great Falls Tribune, Dellwo was bowhunting near a creek bed with his brother Shane. Strong wind and intermittent snow and rain kept visibility to a minimum, but the brothers heard elk bugles in the area and Dellwo was eager to make his first elk harvest of the year. The hunter had been steadily driving the animals toward his brother, but the weather also hid a sleeping grizzly, which Dellwo practically tripped over. At less than three feet, there was little that Dellwo could do before the animal charged him. The grizzly knocked Dellwo off his feet and bit him in several places across his head. It then reared back and gave what the hunter later described as the loudest roar he had ever heard, before attacking him again and biting his right leg. It was at this point that Dellwo recalled that an old survival tip about how bears have sensitive gag reflexes—so the hunter plunged his arm down the animal’s throat. The bear promptly left. Dellwo is not the first person to have stuck their arm down a bear’s throat and lived to tell the tale. The trick is commonly regarded as a last-ditch defense against bear attacks. As recently as last November, a hunter in British Columbia used to same trick to disable and ultimately kill a large grizzly sow near Fernie. According to CTV News, Wilf Lloyd was seriously mauled by the bear before he was able to stop its biting by jamming his hand down its mouth. While the bear was still on top of the man, Llyod’s son-in-law arrived and shot it dead with a rifle. Lloyd also received a bullet in the leg during the chaotic struggle, but he did not blame his hunting companion in the least. Dellwo echoed Llyod’s sentiment after his own bear encounter. Shortly after the attack, he was able to reunite with his brother and was transported to a local hospital, where he was treated for various cuts and punctures on his head and right leg. 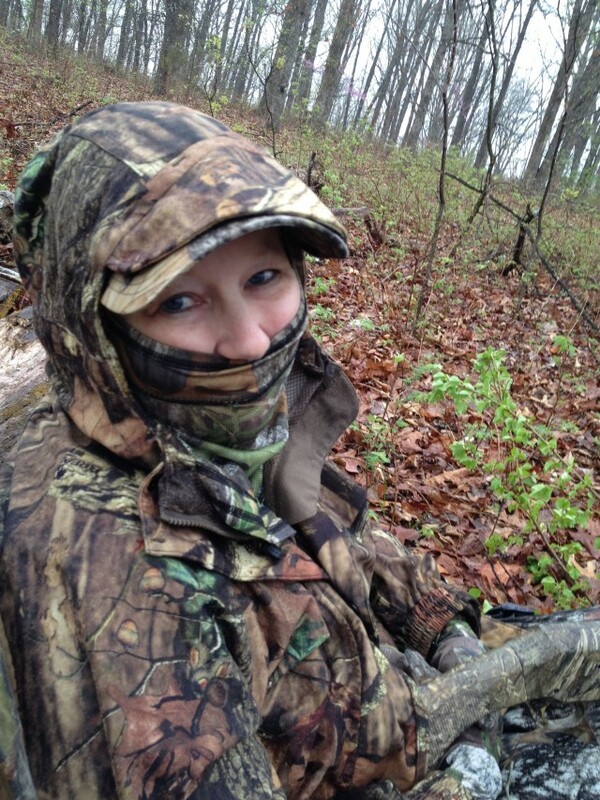 Dellwo expects to be back in the woods later this year for rifle season. On Aug. 31, Bill Lawrence, 40, got separated from his hunting partners and remained lost for five days. As told to Colin Kearns. Wednesday. I’d just killed my first squirrel when I glanced over for my friends Russell and Cris. They were gone. Russell was the only one who’d hunted these woods, Meeman-Shelby Forest north of Memphis. We’d been hunting for 20 minutes and were deep into the forest. Russell and Cris stuck together, while I drifted to their left. I tried to stay within eyesight of them, but I was also watching for snakes. The last time I saw them, it looked like they were continuing in a straight line. Then I stopped to shoot the squirrel. I thought I had an idea where they were, but an hour later I wasn’t any closer. I shouted, but the thick woods only swallowed my cries. So I turned to hike back to the truck, but an hour later I was even more lost. I kept walking, though, figuring I’d find a way out. I walked, stopping to rest now and then, until it started to get dark. I’d fired a couple of shots but got no response. It never got cold, which was good because I had nothing to build a fire with. I doused myself with bug dope, then lay down. With my vest, I was able to cover my face and roll up the bottom end to use as a pillow. That dead squirrel in the pocket added a decent cushion. I heard helicopters but they couldn’t see me through the trees, and I wasn’t going to run through the woods in the dark. I just prayed they’d find me tomorrow. Thursday. I finished the last of the two water bottles I’d brought with me that morning. The days were hot, and I was walking and sweating a lot. I needed to stay hydrated. Fortunately, it rained that morning, and I managed to catch a half bottle’s worth of water. 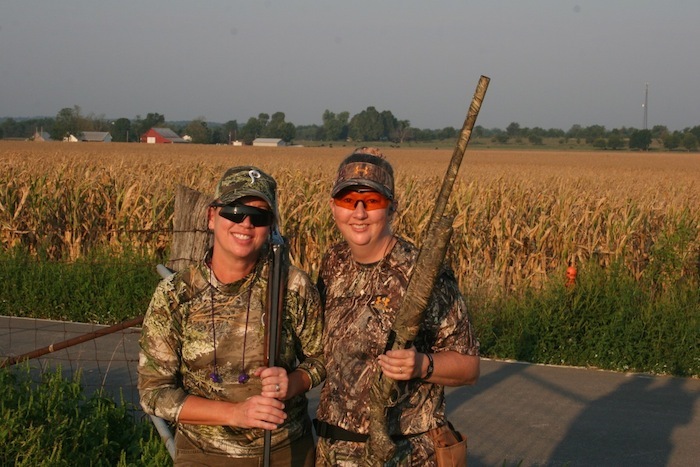 I mostly squirrel hunt, but I have enough experience hunting deer and rabbits that I can identify tracks—and I know that if you follow those tracks, they’ll often lead to a water source, which in my case was a puddle in gumbo mud. I dipped my empty bottle and watched it fill with gray, grimy water. I didn’t want to drink it. I worried it’d make me sick. But what choice did I have? I was already getting dehydrated. The taste was nasty—dirty and sandy—but the dip of mint Skoal I had in my mouth made it at least drinkable. I figured I should eat something, too, even though I wasn’t starving. I turned a dead stump over and found some nightcrawlers. They tasted about as bad as the gumbo water. I don’t know how many I ate—only that I’d never eat another one. The rest of Thursday was a lot like Wednesday: Walk, then break for a nap. Walk, then nap. That second day, as I was walking—with no real end in sight—is when I started talking to God. Why is this happening? If I don’t make it out, will you take care of my wife and kids? That night I awoke to a WHOOSHWHOOSHWHOOSH. Dazed, it took me a moment to realize that it was another chopper—and that it was right above me. I stumbled to find the flashlight in my vest. But by the time I turned it on, it was too late. After the chopper left, my flashlight burned out. Friday. I kept moving and praying—all day. Walking gave me a purpose. Praying gave me strength. I truly believe my faith is what kept me from ever panicking. That afternoon I stumbled upon some persimmons. They were the most delicious things I’d eaten in a long time, and they were just sitting there on the ground, perfectly ripe, waiting to be found. Saturday. I heard a low-flying chopper that morning. I took the T-shirt I had on under my camo shirt, tied it to the barrel of my Mossberg, and rushed to the nearest open area where I waved it around. But it never got close enough. I was weak and tired. My body ached. For the first time I started to think I might not get out. I had started with 15 shells, and by then I only had four or five left. 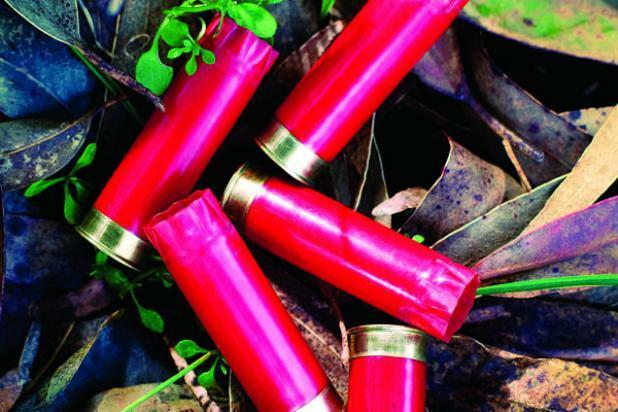 I’d been firing them and leaving the shells at spots where I rested. But on Saturday I decided to fire the rest I had at once. I didn’t know how much more of this misery I’d have to suffer, and I didn’t want the option of taking my own life. Later that afternoon, as I was resting, I heard two sounds: a Harley-Davidson and a chain saw. I decided to stay put for the remainder of the day and save my energy. Tomorrow, I’d travel toward those sounds. I just knew that if I didn’t get out on Sunday, I never would. Sunday. I came to a hill that I wasn’t sure I had the strength to climb. I sat down on a nearby log and prayed for strength. When I finally got up and walked to the hill, I glanced to the left where I saw a trail. And I took it. Bill Lawrence had no method of striking fire, carried nothing to signal with but his shotgun, and possessed no tool to navigate to safety but his brain. When he became lost, he had nothing to eat but nightcrawlers and no means to disinfect water. He was unfamiliar with the country and carried no map. To sum up: He struck into the woods about as unprepared as a man can be. But before you criticize him too harshly, take a look at yourself. 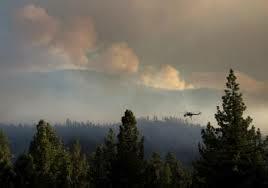 Have you ever been similarly unprepared for an emergency, using the excuse that you only plan to be gone a few hours and won’t stray more than a few hundred yards from the road? I know I have. Lawrence’s ordeal should be a cautionary tale for all of us, emphasizing the importance of carrying basic survival gear every time we go afield, no matter how small that field we intend to hunt. A compass, a whistle, a sparking wheel, Tinder Tabs, and chlorine tablets weigh about as much as a tin of Altoids, and easily fit inside one. S - - t happens. Have a hat for it. Lawrence’s reaction to being lost was to walk and then walk some more. By doing so, he disobeyed the four steps that almost ensure survival: Stop. Shelter. Signal. Stay. Had he stopped walking, tied his undershirt to a treetop or placed it in an opening where it could be seen or, better yet, spelled SOS in a clearing with branches or stones, then hunkered out of the wind to wait, he probably would have been found quickly after being reported missing. Ninety percent of search-and-rescue operations are resolved during the initial hasty search, usually within 10 hours. One thing that Lawrence did do right needs to be emphasized: He never panicked and was determined to survive. The right attitude is one positive that can make up for a lot of negatives in any survival situation. 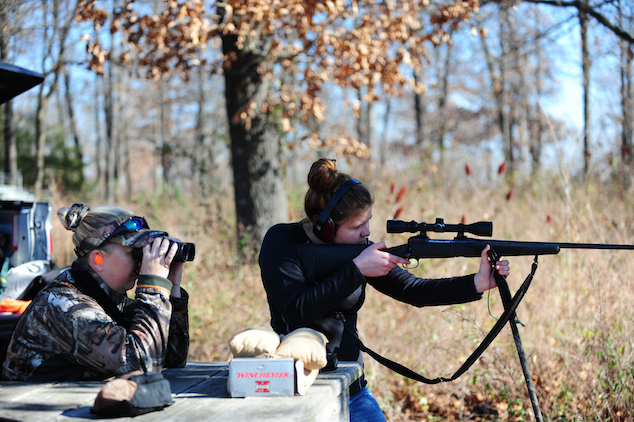 Modern firearms are powerful tools that experienced shooters understand need to be treated with respect. While a gun is in use, we carefully follow a set of common sense rules to keep everyone safe. 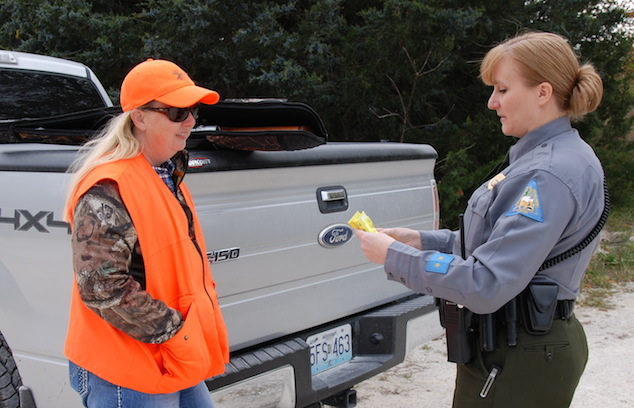 But how do we practice firearms safety when the shooting or hunting sessions are over? Most of the guns folks own will spend the majority of their working life at rest, placed in one state of storage or another, until the next shooting event. Since they remain powerful tools between trips to the range, it’s very important to store them properly. Trigger locks fulfill a single safe gun storage objective: Prevent the gun from firing. Most new guns now arrive from the manufacturer with a trigger lock of some kind or other in the box. Trigger shoes clamp and lock around the trigger housing to prevent the trigger from being pressed. They should not be engaged on a loaded gun because they come in contact with the trigger as they are installed and removed. 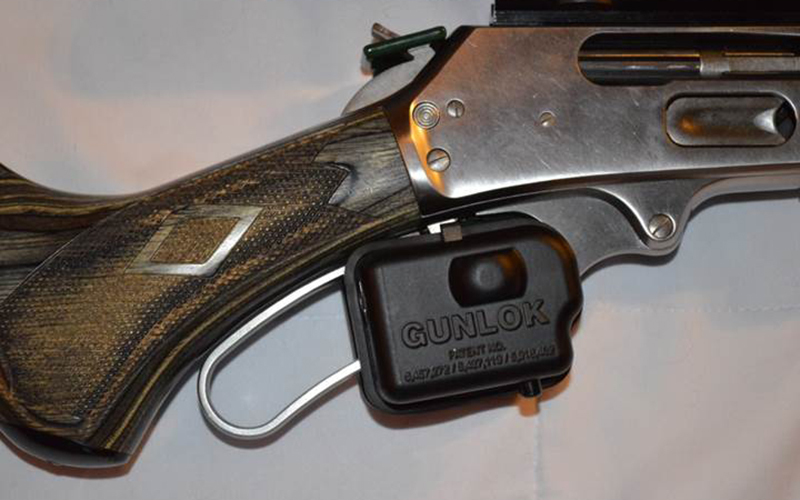 Cable locks allow the shooter to run cable through the barrel or action of a firearm. Since the cable blocks the action from being closed, the gun cannot be loaded or fired with the cable lock in place. If these two lock options are not available, a simple household padlock can be looped over the trigger guard with the hasp set behind the trigger. This will prevent the trigger from completing a firing cycle. Although trigger locks are inexpensive (or even free), and can successfully prevent a gun from firing, they do nothing to protect the gun’s finish or to deter theft. 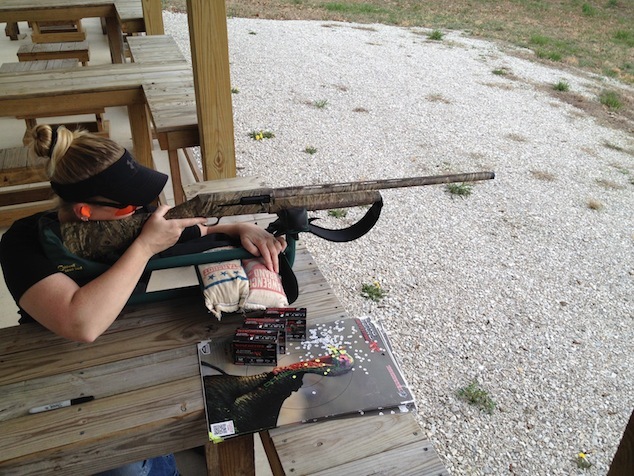 Most sporting goods stores have entire aisles dedicated to affordable handgun, rifle, and shotgun cases. The options available range from padded fabric sleeves to rugged foam-lined plastic cases. The primary role of this kind of affordable carry case is to protect guns from physical damage. While they do a good job of preventing dings and scratches, their role as a security device is relatively limited. Most soft and hard side cases can be “legally” locked for transport to and from the shooting range (check your local regulations). This could be a luggage lock through a soft case’s zipper pull, or a padlock through the handles of a hard case. This security system may be enough to keep small children out as well. However, the materials these cases are made of are easily defeated by ordinary edged implements. These low-cost cases also have a low theft deterrence value since they are light and easy to move. They have to be hidden or locked inside of another container to protect them from theft. 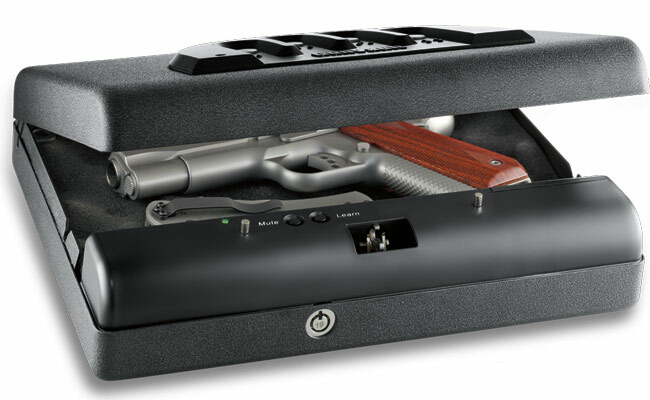 In an effort to strike a balance between the security offered by a locking gun cabinet and the portability of a gun case, several companies offer portable strong boxes and metallic gun cases. 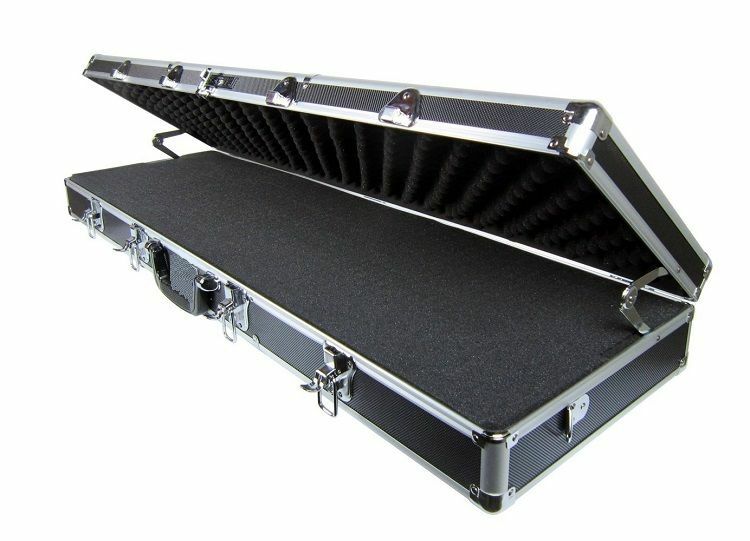 Metal gun cases usually incorporate a reliable locking system or the means to attach heavy padlocks. Strong boxes, usually intended for handguns, offer mounting systems for permanent attachment to a fixed surface. Some boxes are fitted with quick-opening locking mechanisms, including electronic push-button access and fingerprint scanners. Strong boxes and metallic gun cases are the first products discussed so far that start to fill all three mandates of a safe gun storage device. They can effectively protect against unauthorized access because of the difficulty in opening these units without a key or lock combination. These containers will effectively protect a gun’s finish from damage. And, if they can be attached or locked to a fixed object or surface, they offer some level of theft deterrence. But with features to fill all three mandates, the price starts to go up. It may be necessary to purchase batteries or extra mounting hardware to take advantage of all the storage device’s available features. Remember that grand wooden gun display case that your great-uncle had in his den? Looking through the engraved glass panes of the double doors, you could see his beautiful vintage shotgun collection. Sometimes he would retrieve that little brass key to open the doors so you could get a better look. 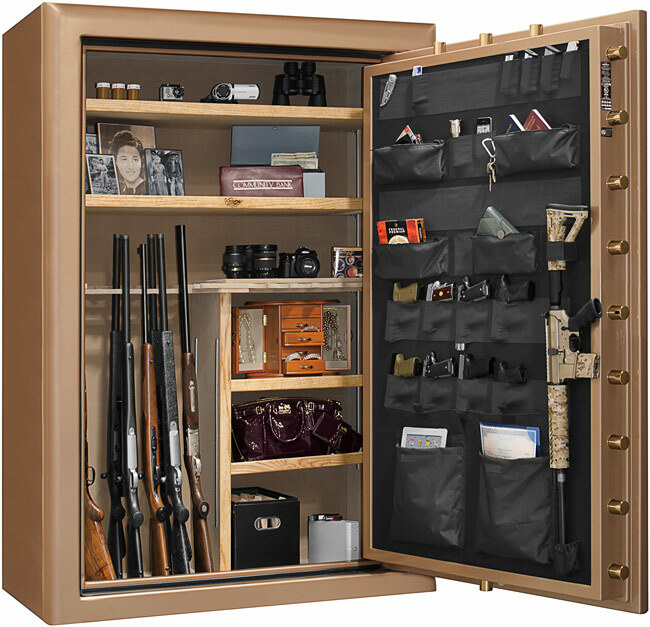 While this kind of locking gun cabinet looks wonderful, it does not offer any truly viable level of safe gun storage, accept against small children. 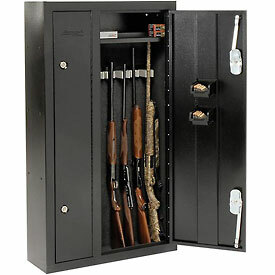 To secure firearms, a locking steel gun cabinet is a more secure choice. Cabinets differ from gun safes in several respects. They follow a less-is-more design. The thinner gauge of steel, a simple locking mechanism, and the lack of fire-proofing insulation greatly reduces the cost. Because they are light enough to be safely carried by one or two people, they can be set up in apartment buildings or second-floor rooms where a gun safe would simply be too heavy or difficult to install. Cabinets are a big step up from metallic gun cases or strong boxes when it comes to storing multiple firearms. They offer a much larger storage capacity and more configuration options. Cabinets can be securely bolted to a wall or to the floor. However, they do not offer the same level of theft deterrence as a gun safe. If you have the cash for a high-end cabinet, and the room to store it, you may want to spend a little more and purchase an economy-line gun safe. 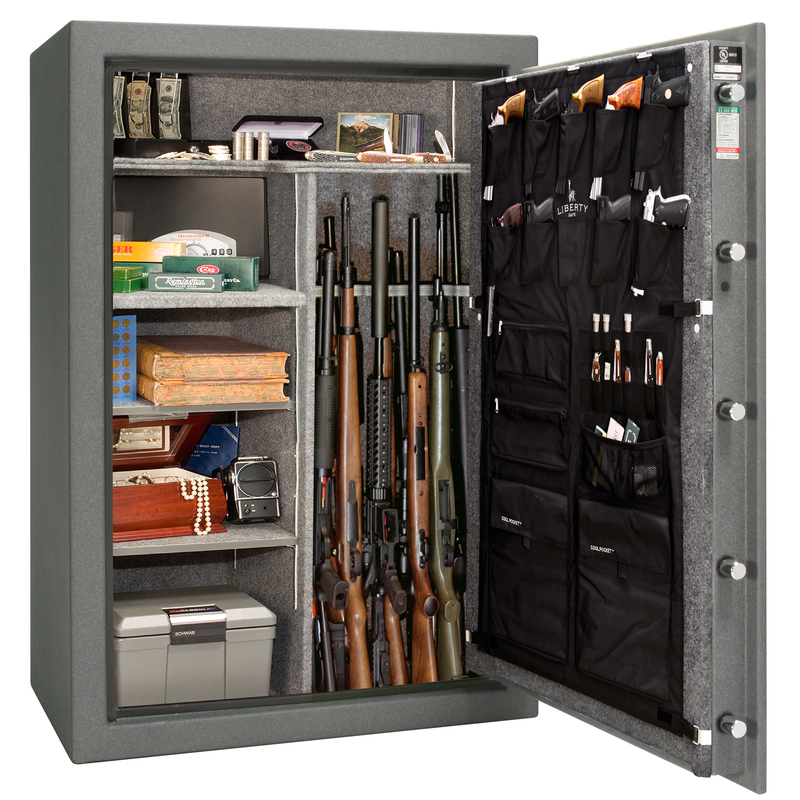 Simply stated, gun safes are the most secure gun storage option available to the average gun owner. Even the basic units have terrific advantages over any of the other gun storage units described so far. A locked safe will definitely prevent a gun from being handled or loaded. The upholstered interior and built-in gun racks will help to protect the finish of the firearms while allowing air to circulate. And, best of all, they are an effective theft deterrent. Much like automobiles or personal computers, gun safes are available with a wide variety of features, locking systems, and finishes, all of which affect the bottom line cost of the unit. These cost-changing features include the gauge (or thickness) of the steel used to construct the safe, the strength and reliability of the locking mechanism, the level of fire resistance (if any), the extent of the warranty, shelf and rack configuration options, as well as the color and quality options for the exterior finish. Because all gun safes are relatively expensive (compared to other gun storage options) it makes sense to consider what you want very carefully before you buy. First-time safe buyers should be careful to avoid two common, but serious, mistakes. The first thing to avoid is buying a safe that’s too small. A unit that’s a perfect fit for your collection today may not serve your needs in ten years. A bit more expense up front may save you the trouble of changing out or adding a second safe down the road. The second mistake is waiting too long to buy one. 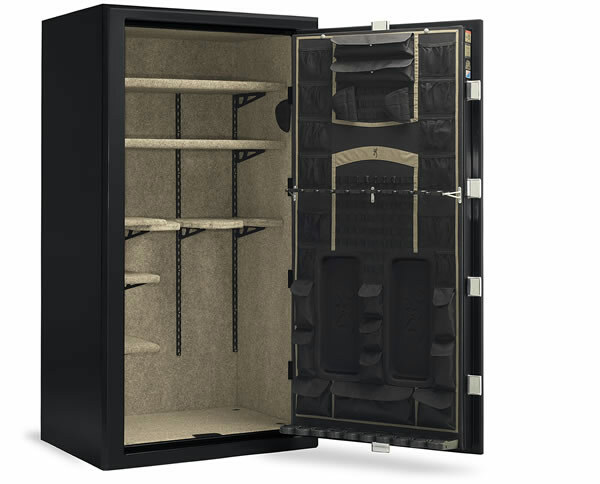 Yes, gun safes are big, heavy, difficult to install, and expensive to pay for. But they are well worth the trouble if you have a gun collection you care about. How do you know it’s time to invest in a gun safe? If the guns you have are worth more (sentimentally as well as financially) than the cost of the least expensive safe you would be willing to purchase, then it’s time to start shopping for one.